I don't know how to even start sharing how thankful I am for this book. A little over a year ago I began reading Denver Snuffer's works. I was a bit hesitant to begin The Second Comforter: Conversing with the Lord through the Veil, due to the implications on the cover and the title. I was hesitant to explore books that weren't "Deseret Book" approved. A trusted friend recommended it, however, and due to consistent reading of these books, my entire concept of the gospel feels 180 degrees changed, improved, and enlightened. I am so thankful to God for the books coming out of the keys at Denver Snuffer's computer. They are truly inspired. Nephi's Isaiah is a companion to The Second Comforter, and leads the reader to an enhanced study of the The Book of Mormon. 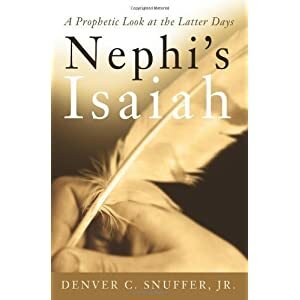 I always wondered why Nephi took up such great space in The Book of Mormon to cite Isaiah, especially if he knew that we would already have Isaiah's words to read from the Bible. This book presents a "why", and also a new way to read it. I have never been very much inclined to read nonfiction gospel study works. I get bored quickly, and often don't enjoy the simplicity of some of the books, or the odd focuses on the author. This piece does none of that. It's not senseless writing, or intended to give the reader excuses on why they can ease up on strict commandments. It's bold, just like Nephi. It's clarifying, and makes words and customs easier to understand, and quite frankly, answers so many of the "whys" which I've been looking for answers for for years. One point I really enjoyed near the ending is how it is pointed out that Nephi did not have a broad audience to preach to. He likely felt small, or incidental among his people, even though he was their leader. He saw our day, but it is clear that he leads more people now than he ever did in mortality. I find the idea fascinating. And as expected from this author, he never takes credit, but acknowledges that anything useful is from God and Nephi, and says that anything useless is his fault. Always makes me laugh a little. If we could all be so humble. What are your thoughts? Have you tried any of Snuffer's books? Would you try one? Please share if this review has helped you in some way. Thanks! I have read all 8 of Brother Snuffer's books, by the way, whatever royalties the book sales earn those funds are donated to The Church of Jesus Christ of Latter-day Saints. So you buying a book he has written does nothing financial for Brother Snuffer. I like Brother Snuffer. I think his stuff should be read by every member. I think if they did they was have a stronger desire to seek the Second Comforter in life, like Joseph Smith said we should. As far as Deseret Book is concern I enjoy going to it but most of my books I choose to buy are not "Deseret Book" approved. I enjoy authors that focus on the deeper Mysteries of Godliness and try to focus more of the things Joseph Smith could never get in to the minds of the Saints of his day. Confetti Bookstore in Spanish Fork and Benchmark Books in Murray are bookstores that I enjoy better than Deseret Book. Thanks for the comment, and the links. I've heard of Avraham Gileadi but not Daivd Dye. I'll for sure check out their links. I agree about Deseret Book, and my whole perception has shifted since I read Snuffer's first book... hence "A Major Shift". It certainly played a part in the creation of this site. Please stop by again, and let me know how to follow you back. :) Thanks! At this time I do have a blog you can follow me back on but if I ever do have one I will let you know. Here are a few blogs I have really enjoyed, maybe you will too! There are other blogs I like but these are a few of my favorites. WOW!!! This is wonderful!!! I've been meaning to find some similarly focused blogs for months now, but haven't known where to start. I love reading others' thoughts on these topics, but there are so few near me to bounce things off of, especially when I finish a book and have been enlightened. I so very much thank you for referring me to these! Please do let me know if you ever start up a blog. Would love to keep in touch!